Some sports are played by millions of people all around the world. Others are played by an elite few, but shared with the world through live coverage and media attention. And then there are the lesser known sports, played only by eccentric individuals (probably called cuthbert) or university students. 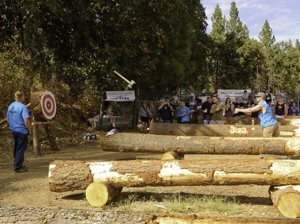 Popular at lumberjack competitions, axe throwing is a sport in which players throw an axe at a target, attempting to reach the bulls eye. On the target, the outside ring is worth 1 point, the second ring is worth 2 points, and so on with the bulls eye worth 5 points. In a game, each player is allowed 5 throws with a maximum of 25 points possible. 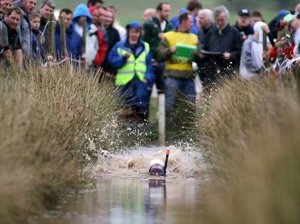 Bog Snorkelling takes place in a 55-metre-long water-filled trench carved out of a peat bog (comprised of dead plant material). Competitors wear snorkels and flippers and cannot use traditional swimming techniques, but rather must rely solely on flipper power to get across and back. Kirsty Johnson set the record back in 2014 with a time of 1 minute and 22.56 seconds. 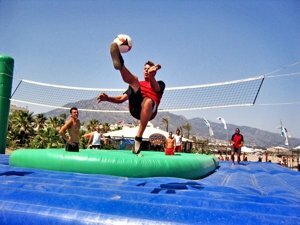 Originating in Spain, Bossaball comprises elements of volleyball, football (soccer), gymnastics, and capoeira. The game is played on an inflatable course with inbuilt trampolines on each side. The teams consist of 4-5 players with the aim of getting the ball over the net without the other team being able to return it. 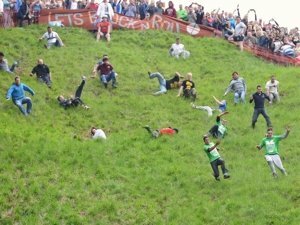 The Cooper’s Hill Cheese-Rolling & Wake is an annual event that takes place each spring near Gloucester, England and involves a 9lb round of cheese, which is rolled from the top of a hill. Competitors race after the cheese and the first person to reach the finish line at the bottom wins the cheese. 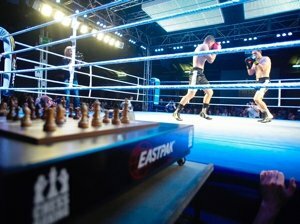 Unsurprisingly, Chess Boxing involves both the classic game of chess and the popular sport of boxing. The competitors alternate between 5 rounds of boxing and 6 rounds of chess for a total of 11 rounds, each lasting 3-minutes. The game was inspired by a French comic and invented by Dutch artist lepe Rubingh. Cycleball is also known as “Radball” and is essentially a game of football (or ‘soccer’ depending on which country you’re from) played on bicycles. Unlike traditional football, however, players use the bike to control, flick, and move the ball into the opposing team’s goal. The bikes used have fixed gears with no brakes and there tends to be 2 players on each team. 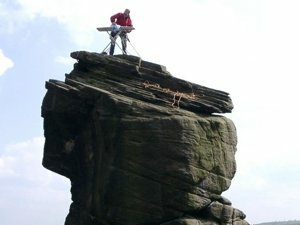 Extreme Ironing is considered a ‘danger sport’ in which people take ironing boards to various, often remote, locations to iron clothes and take a picture. Some of the locations have included cliff tops, underwater, in the middle of a motorway, and also whilst skiing and parachuting. Giant Pumpkin Kayaking is quite simply the sport of kayaking inside of a giant, hollowed-out pumpkin. 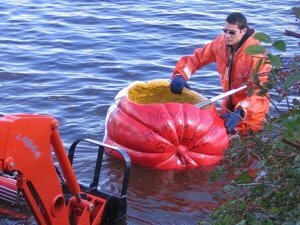 The most famous race takes place on Lake Pesaquid in Nova Scotia at the annual Windsor Pumpkin Regatta. The course is a half-mile long and competitors often decorate their pumpkins with paint and flags. 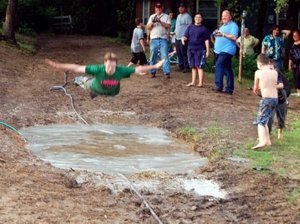 The Mud-Pit Belly Flop is one of the biggest events that takes place during the ‘Redneck Games’. The event, of course, takes place in a giant mud pit and the crowd gathered to watch chooses the winner by judging who can make the biggest, muddiest splash. The winner receives a trophy – always featuring a smashed beer can. 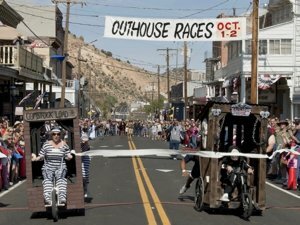 In Outhouse Racing, an outhouse (outdoor toilet) is kitted with wheels, brakes, and a steering system and is raced down hills with competitors sitting on the toilet seat inside. Competitors decorate their outhouses with clever names like “Royal Flush” and the first outhouse to make it across the finish line wins. 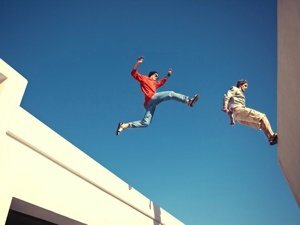 Parkour is the act of running, jumping, swinging, climbing, etc. based on military obstacle course training techniques. It is often practiced in urban environments with the aim of getting from one point to another as quickly and as efficiently as possible without the use of specialised equipment. 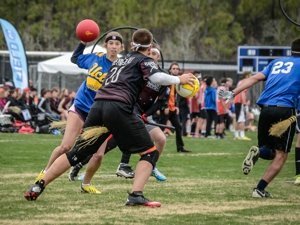 Quidditch was invented by J.K. Rowling in her Harry Potter series and involves 2 teams of 7 players mounted on broomsticks with 4 different balls and goals on either side of the pitch. The game has since been adapted for the real world with the ultimate goal being to score more goals than the other team before the ‘snitch’ is caught. The Running of the Bulls takes place in the summer in Pamplona, Spain. 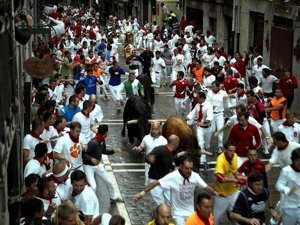 The event involves patrons running in front of 6 bulls that have been let loose in the town’s streets. Every year between 50-100 injuries are reported with 15 deaths reported since 1910. 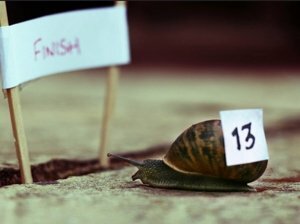 Snail Racing is essentially a race between ordinary garden snails with snail racing events taking place around the world. The snails tend to race on a 13-14 inch circular track and start in the centre with the winning snail being the first to reach the perimeter. Racing numbers or stickers are often put on the shells in order to distinguish each competitor. Like arm wrestling or thumb wrestling, toe wrestling involves two competitors who lock bare feet in attempt to pin the other person’s foot to the ground for at least 3 seconds. There tends to be 3 rounds played with the winner having the best 2 out of 3. Underwater Football is a variation of football played in a swimming pool using snorkeling kit. Players of the two teams are submerged underwater and must get the slightly weighted football into the gutter on the opposite side of the pool. Some variations use a pool toy torpedo and weighted goals at the bottom of the pool. 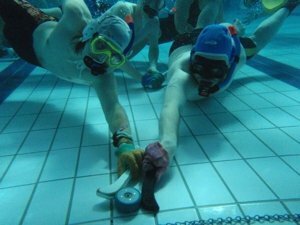 Underwater Hockey, also known as ‘Octopush’, is essentially a game of hockey at the bottom of a swimming pool. The aim of the game is to push the puck into the opposing team’s goal using a small pusher. The game involves 2 teams of up to 10 players with players using diving masks, fins, and snorkel gear. 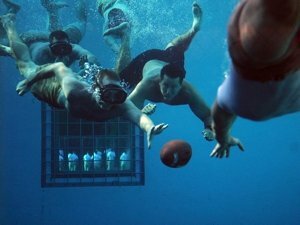 Underwater Rugby is a rugby match that takes place under water in a swimming pool with two teams. Each team, kitted in snorkel gear, attempts to score a goal at the bottom of the pool using a weighted ball filled with saltwater. The ball must never leave the water and can only physically travel about 2-3 metres when passed. 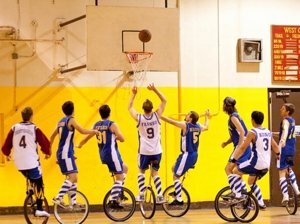 Unicycle Basketball is a variation of the traditional game but where all of the players are mounted on unicycles during play. The same rules apply, such as dribbling the ball whilst riding, and trying to score in the other team’s net. 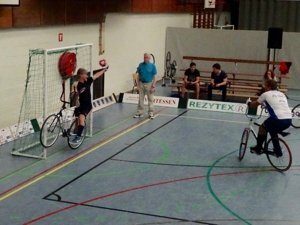 The game is played on a regulation basketball court and players tend to use 24” unicycles. 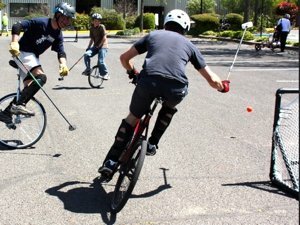 Unicycle Hockey is exactly as it sounds – hockey but on unicycles. Each team is comprised of 5 players who must have both feet on the unicycle at all times. Equipment used includes the standard ice hockey sticks and a tennis ball with the aim of the game of course being to score points by getting the ball in the other team’s goal. Unicycle Polo uses unicycles in place of horses. Using the standard long-handed mallet and the wooden ball used in traditional Polo, the players’ objective is to score into the opposing team’s goal all whilst riding on unicycles. Originally invented in Finland, Wife Carrying is a sport that involves a male competitor racing through 2 dry obstacles and 1 water obstacle approximately 1m deep all whilst carrying a female teammate. The female must weigh at least 108 lb (49 kg) or additional weight will be added to her. Teams who complete the course in the shortest time win with additional prizes for best costume, etc. 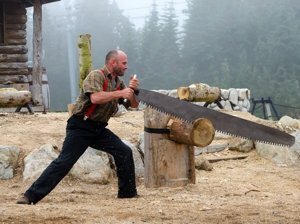 In a wood chopping competition, the aim of the game is to be the first “axeman” to chop or saw through a log or block of wood. These sorts of competitions are often found at places, such as state fairs and agricultural shows, and have been around since 1870. 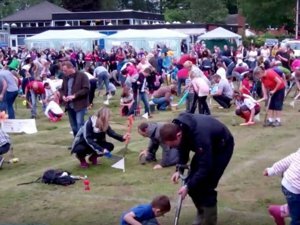 Worm charming is a competitive sport with the aim of attracting earthworms out of the ground. The competitor to charm the most worms within a set period of time and a set zone on the ground wins. In 2009, Sophie Smith of England (aged 10) set the world record with 567 worms. 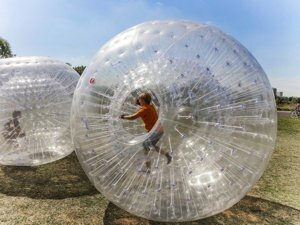 Zorbing is considered a recreational sport that involves rolling down a hill in a transparent plastic orb – essentially a “hamster ball”. It is generally used on hills, but can also be used on water, as well as flat surfaces. Orbs with no harnesses can carry up to three people, whereas a harnessed orb can only carry 1 or 2.